Using the Gran Telescopio Canarias in La Palma, the scientists studied a debris disc orbiting a white dwarf 410 light years away, formed by the disruption of rocky bodies composed of elements such as iron, magnesium, silicon, and oxygen—the four key building blocks of the Earth and most rocky bodies. Within that disc they discovered a ring of gas streaming from a solid body, like a comet's tail. This gas could either be generated by the body itself or by evaporating dust as it collides with small debris within the disc. Lead author Dr. Christopher Manser, a Research Fellow in the Department of Physics, said: "The star would have originally been about two solar masses, but now the white dwarf is only 70% of the mass of our Sun. It is also very small—roughly the size of the Earth—and this makes the star, and in general all white dwarfs, extremely dense. "The white dwarf's gravity is so strong—about 100,000 times that of the Earth's—that a typical asteroid will be ripped apart by gravitational forces if it passes too close to the white dwarf." "If it was pure iron it could survive where it lives now, but equally it could be a body that is rich in iron but with internal strength to hold it together, which is consistent with the planetesimal being a fairly massive fragment of a planet core. If correct, the original body was at least hundreds of kilometres in diameter because it is only at that point planets begin to differentiate—like oil on water—and have heavier elements sink to form a metallic core." Dr. Christopher Manser said: "As stars age they grow into red giants, which 'clean out' much of the inner part of their planetary system. In our Solar System, the Sun will expand up to where the Earth currently orbits, and will wipe out Earth, Mercury, and Venus. Mars and beyond will survive and will move further out. 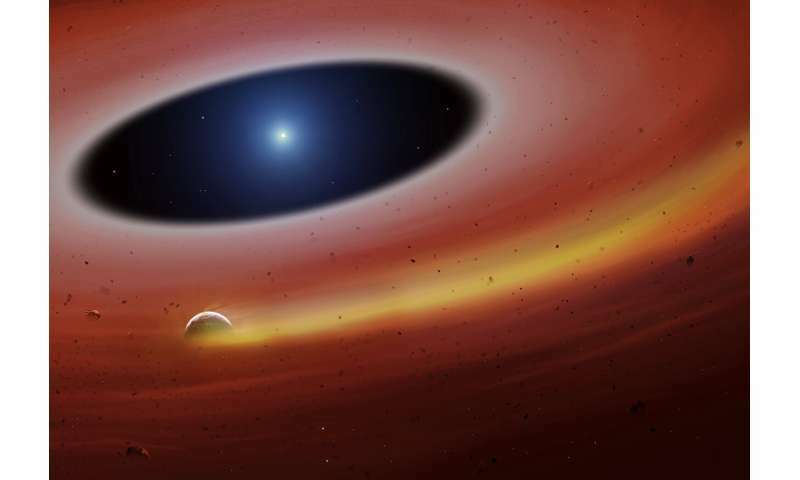 "Our discovery is only the second solid planetesimal found in a tight orbit around a white dwarf, with the previous one found because debris passing in front of the star blocked some of its light—that is the "transit method'' widely used to discover exoplanets around Sun-like stars. To find such transits, the geometry under which we view them has to be very finely tuned, which means that each system observed for several hours mostly leads to nothing. The spectroscopic method we developed in this research can detect close-in planetesimals without the need for a specific alignment. We already know of several other systems with debris discs very similar to SDSS J122859.93+104032.9, which we will study next. We are confident that we will discover additional planetesimals orbiting white dwarfs, which will then allow us to learn more about their general properties." Well, that piece of planet will likely be drawn into the remnant Star to be consumed also. How unlucky that it wasn't kicked out farther to possibly join a different Star system where it might have a chance to acquire more dust/gas to itself - building up again to its former size and mass. Only a supernova could kick it so far. To completely escape its solar system a planet or a planetary remnant requires very high acceleration and speed. A supernova can provide that speed (assuming it doesn't annihilate the object), but a main sequence star which turns into a red giant and then to a white dwarf cannot. The same applies to the Sun of course. You are right that the remnant will be consumed by that white dwarf, since it is well within its gravity well. Bigger objects (such as stars and galactic centers) and faster rotation produce bigger rings and a very fast speed of rotation produces a disk (elliptic galaxies and so-called protostars 6). The rings, asteroid belts and disks have their own orbits and an orbital speed, that is no different to the other objects' orbits. The faster rotation of an object and an orbital speed, measured closer to the object, is higher and it decreases with the distance from the main object. It makes me wonder if objects like Oumaumau are not created in a similar fashion, a 'splinter' of a planet coming apart can happen if pockets of more volatile materials should expand and pop sending shreds of the material outwards. If it cools before it can contract it should hold the 'splinter' shape. Finding objects similar would sure go a long way for a space-faring life form, imagine all the materials you could ever use in a very long lifetime right there and hardly needing refining. Not like Earth where most materials we look for are chemically bound with other elements. With this in mind I would expect there to be more deep study of Nickle-Iron Asteroids and meteorites.